The door to a joy-filled life can be opened only from the inside. 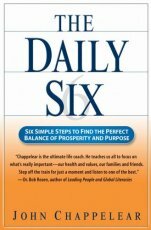 The Daily Six is your key. Be open to change, face your fears, and give up controlling behavior. Focus on the success of others, keep learning, and persevere. Willingness creates honesty, self-awareness, and open-mindedness. Even the briefest period of contemplation gives you the opportunity to set your heart in the direction that determines the course of your day -- and your life. Your service to others will change your focus from "What's in it for me?" to "What's in it from me?" With love, you begin to understand someone else's needs and consider them as important as your own. With forgiveness, you begin to let go of anger, resentments, and fears. Expressing love will bring you love. Practicing forgiveness will bring you peace. When you practice gratitude, you change every relationship in your life. Your efforts are rewarded with a more positive and productive life. There is no direct line to happiness. Rather, you have to go through gratitude to get there. You may find much satisfaction in analyzing, planning, and contemplation, but change starts only when you take that first step. Even a small step is important, because small changes, practiced consistently, transform great ideas into dramatic results. For years, John Chappalear's personal mantra was "Everything! All the Time! Right Now!" A success by every external standard, he built a multimillion-dollar business, owned luxury homes and cars, and enjoyed all the benefits that lots of cash can buy. But his all-consuming quest for more ultimately led to a divorce, estrangement from his children, and a crisis of faith in himself and the value of his life. Then, in a bitter twist of fate -- or what he has come to call his own Gift of Desperation -- Chappalear lost the business that he had worked so relentlessly to build. Today, as a self-described Recovering Big Shot, Chappalear has committed himself to the pursuit of success with significance. In changing the priorities of his own life, he developed and codified the Daily Six - six principles that provide a bridge between career success and personal well-being, and that have become the cornerstone of his corporate and personal consulting work. According to the Daily Six, changing the focus of one's life begins with willingness, germinates in quiet time, and flourishes through service to others. The journey to a well-balanced life is enlightened by love and forgiveness, but can be fulfilled only through action. When observed daily, these principles result in both career achievement and personal contentment.